I remember when my wife went through her “food enlightenment” about a decade ago. The first manifestation of her enlightenment was a desire to eat French food. That was kind of shocking to a burgers and pizza guy like myself. What the hell was French food anyhow? But what was I going to do? Disobey, complain? Nope, neither. I adapted…yes I did. 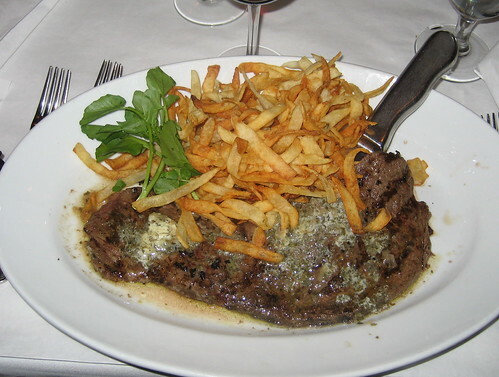 So I order steak frites the first time we go Franco, and I was hooked. It’s just a fair-to-middlin’ hunk of beef, usually with a butter and wine sauce concoction, and a few handfuls of fries tossed on top. You call that gourmet, Pierre? I call that meat and potatoes baby, and it rocks. It didn’t take me long to develop a keen appreciation for steak frites, onion tartes, and Audrey Tautou. That brings us to the fine Lettuce Entertain You restaurant Mon Ami Gabi, at 2300 North Lincoln Park West. I like it a lot and the Steak Bearnaise (pictured, $19.95) is my usual. Yes, paying just south of $20 for an okay piece of meat with potatoes may not seem to jive with the intent of Tasty Chicago, especially when you can get about 3 times that much beef at Tango Sur for about the same price. But it’s the sauce in combination with the fries that makes it worth the money. Actually, it’s a tarragon shallot butter sauce you see on top of that steak. The sauce has a lot of flavor and the wide fry really does a fine job of collecting it all. It’s tough to beat a few fries saturated with tarragon shallot butter on the same forkful as a piece of beef. My love for burgers and pizza has taught me the import of having a protein and a starch in the same bite, and steak frites fits that bill perfectly. Yes, there’s probably better French in town, but my taste buds can’t really differentiate. The steak frites here are great, the coffee damn good, and they probably have the number one dessert in the history of confections, the Banana Foster Crepe. That dessert is a whole separate post, I don’t want to get into it now. Posted in food on 2007/03/24 by John.